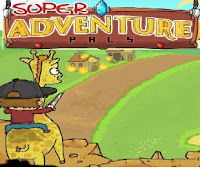 Super Adventure Pals is a new loveable action adventure platforming game from jayarmstrong in which you travel land far and wide battling monsters along the way as you try to rescue your pet rock from evil Mr B. Fear not for you are not alone, you have the help of your good friend, the magical giraffe, I said magical because it can shoot laser rainbows. Level up your hero to have him wield new weapons and hat colors. Fight a wide variety of enemies and defeat a number of epic boss fights. Important tip: You can get diamonds by replaying finished levels.